The Life of Bon: Why you gotta be so mean? Why do people have to be mean? I'm not talking a little snippy here or ornery here, I'm talking blatantly downright rude. Have you checked out Nat's #mightylove project? That's the type of thing I need to remember on days like today. -There is more good than evil in the world. -There is more love than hatred. -People who are rude are fighting battles we don't know about so we must be kind back. -The kinder you are the easier it is so continue to be kind. Why do you think people are rude? Is it really just the "insecure" thing that people always chalk it up to? Or that they themselves are having a bad or stressful day? If so, I think that's a pretty craptastic excuse to be a jerk to someone else. Enough of that. I'm excited to introduce Katie to you. Some of you might want to throw stones at me, but I will be the first to admit that I don't struggle much with my weight so I can't say much about the subject. I do, however, have an immense respect for those who do struggle and who diet and discipline and control and motivate others to lose weight and maintain a healthy lifestyle. That's what Katie does. She holds herself and others accountable for weight. And in the meantime she's trying to figure out this whole growing up thing- just like the rest of us! Hi everyone! I'm Katie and I blog over at KTJ Weighing In. I write mainly about my day to day life, life in Pittsburgh, my world travels, and I focus on my weight loss journey. I write about the highs and lows and hopefully share a little motivation to others on a similar journey. I'm excited to be here today and I really appreciate Bonnie allowing me to guest post! Thank you, Bonnie! Today I just want to ask: What do you want to be when you grow up? Recently I was talking with a friend and she was feeling a bit lost because she is in her mid-twenties and doesn't know what she wants to be "when she grows up." Sure, we are all adults now, but I still have a hard time believing that I'm actually an adult some days. Who said we had to definitively choose what we want to do for forever by x age? What happened to all the dreaming of all the possibilities that could be? In first grade we had career day. My mom asked me what I wanted to be when I grew up and I told her that I wanted to be a nun. Seriously. My mother was surprised, but she made me a little nun outfit and I went to school dressed as one for career day. People thought it was so cute and nice that I'd make such a choice. Then they realized that I was just confused. When I was little, I went to Catholic school. All my teachers were nun and thus, I thought that a nun and a teacher were one in the same. It wasn't until I dressed as a nun all day in first grade that I realized how mistaken I was. Now it is hilarious to think about. I can only imagine what people were thinking when they saw me dressed as one. For the remainder of most of my childhood I wanted to be a teacher. First an elementary school teacher, then high school. I thought I wanted to teach history or world cultures. But, every teacher I have ever had and my parents all told me that I should be a lawyer. In high school we actually had to write a paper about where we would be in 10 years and I wrote that I'd be teaching at a school. When my paper was returned the teacher actually wrote "if you come back in 10 years and you are not an attorney I will give you $100." So it seemed that I was always pegged by people to be an attorney, spoiler alert I am now actually an attorney. I guess they were all right? Anyway, between the period of time that I wanted to become a teacher and actually became a lawyer, I wanted to be many things. If I wasn't tone deaf I would have loved to be a singer, I wanted to be an Olympian, a doctor, etc. So many dreams or ideas of what I could be and the possibilities seemed endless. Now, I'm very happy in my career. I love being a lawyer, so far. I enjoy what I do. Still, if I could do anything in the world, I think the best job would be going to the countries ahead of time and be one of the people who plans out all the challenges for the Amazing Race. That would be an amazing dream job! In my opinion, of course. So, what do you want to be when you "grow up?" Say hi to Katie here! Labels: how to deal with mean people, how to stand up for yourself, rude comments on blogs, trolls, weight loss, weight loss journey, why are people mean?, why are people rude? It's totally going around and I LOVE your new look! Chin up, buttercup! Remembering that other people are struggling with their own issues has bee the most helpful thing for me in dealing with rude people. It also helps me keep my rude-ness in check. While I generally try to be nice, if I remember I was in a bad mood the day before sometimes I'll go around and let people I may have snapped at know I was having a rough day and I appreciate their patience with me. They always seem to appreciate it - even if I didn't snap at them too bad. Uhg, yes. I work with someone who is a constant interrupter. Very hard to put up with. And Bonnie- as with most things, I think people who are rude and mean do so in order to feel empowered. It may not be insecurity, it may just be a power trip, but they get high on the fact that they have power over people when they do that. I'm always surprised by rude or mean people, and then later upset at myself that I *let* them steal those moments and energy from me, but then I think about how sad it is that they can't be empowered by creative, hopeful things. And since I live by the threefold law, I'm pretty confidant that they'll reap what they sow. 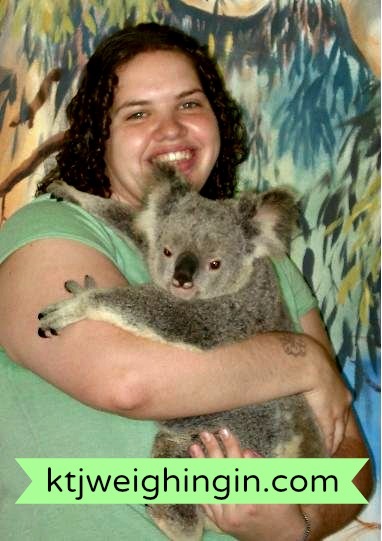 Also, I don't know why I capitalized koala. No clue. First of all - Bonnie, I do the exact same thing about splitting up emotions and the facts - well, it's something I'm working on. I'm constantly being told at work that I need to separate my emotions from my day to day - and it's not that I'm a drama queen, I just have a lot of emotions. So, it's something I'm working on. And I'm proud of you. As for Katie, I still have no idea what I want to be when I grow up - I think I want it to involve social media - which I wish I realized a long time ago, buuuut for now I'll just continue with being a construction consultant. They're practically the same thing, right? Oh, and it's really awesome that somebody made that $100 bet with you - I'm impressed by them. Very cool. Thanks for sharing! !